The Hall of Fame Induction Dinner will be held on Friday, June 6 and the Autograph Show will be held on Saturday, June 7 at Silverton Casino Hotel in Las Vegas. The Hall of Fame Dinner will honor players on the West Coast for their outstanding NFL playing careers and their legendary charitable work off the field. 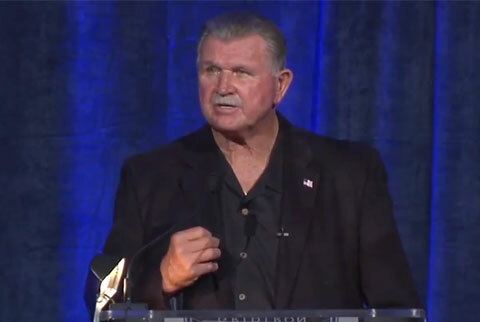 Video shows Mike Ditka presenting the 2013 Gridiron Greats Man of the Year award. The inaugural Gridiron Greats Hall of Fame event started in Detroit, Michigan in 2009 with 150 attendees. Since inception over 40 players have been inducted and the event has grown to over 800 attendees. Gridiron Greats has been able to raise funds and awareness for the NFL retired player community and assist hundreds of players and their families in dire need. Based on success and popularity in Michigan, Gridiron Greats decided to host an additional fundraiser out west. Gridiron Greats 2014 Hall of Fame Inductees include: Jim Plunkett, Jon Arnett, Conrad Dobler, Tom Flores, David Humm, Hugh McElhenny and Ricky Watters. Mike Ditka is a former NFL player, television commentator and coach. He coached the Chicago Bears for 11 years and New Orleans Saints for three years. He was the only individual to participate in both of the last two Chicago Bears’ championships, as a player in 1963 and as head coach in 1985. If you would like to book football speakers or NFL players like Mike Ditka for a speaking engagement, autograph signing, guest appearance, product endorsement, Super Bowl party, celebrity golf tournament, charity fundraiser, VIP meet & greet or special event, contact Mike Ditka’s agent for speaker fees or call 800.966.1380.